With Bible text, thoughtful comment, challenging questions and space for you to think, write, draw and pray; 40 Days: Luke gives you the chance to rediscover Jesus and all that he has for you. 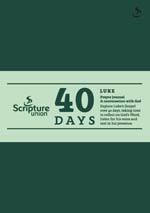 Another prayer journal in the 40 Days series, outlining 40 days of Bible study and reflection through Luke's Gospel – ideal for Lent. * High quality product, would be kept and revisited over time.